Wouldn’t it be great if you never mowed your lawn and it still stayed nice and manicured? There is a way to keep your backyard meticulously manicured and mowed without actually mowing it. If you replace your regular natural backyard lawn with some backyard artificial turf, you will eventually see why artificial turf is the way to go. In the last 50 years or so, artificial turf fabricators have developed much more advanced and useful applications for their products in order to serve a wider range of needs. You may wonder, why bother with fake grass if good old fashioned grass is readily available? In simple terms, the benefits outweigh the costs. Artificial turf requires hardly any maintenance whatsoever. 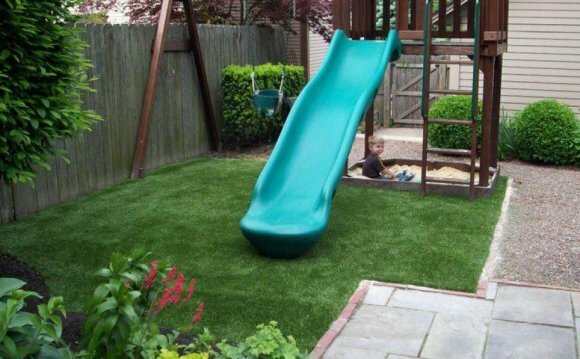 This means that the artificial grass never has to be mowed, fertilized, seeded, or even watered once it is installed. The cost savings in terms of labor and gas for mowing alone make the purchase of installing a backyard artificial turf a real no brainer. No more edging, weeding, and mowing every week. You simply install your backyard artificial turf, and it's done. You can get rid of your lawn mower. You are also lowering your carbon footprint and helping the environment by opting to install artificial turf in your backyard. Also, backyard artificial turf providers offer a great variety of artificial turfs to satisfy a variety of needs. Turfs available for your backyard can be as short and fine as a putting green turf or as tall or thick as a regular grass field. If you are looking to create a safe playground in your backyard, you can even opt to increase the padding fill beneath the backyard artificial turf make it safer for your kids.